Lost footage - Homebrew Con 2017 - Timelapse video from the JAB booth! Hey strangers! Long time, not a lot of posting happening out here, but seeing I have some vacation time here at the end of 2018, I figured I'd post some things I've had laying around. As some of you know, I am an avid homebrewer of beer for many years. As part of this hobby, I participate in a local homebrew club called the Jack of All Brews, based out fo the west metro. As part of this club, we participated in the national event put on by the National American Homebrewers Association called Homebrew Con. Below was some 'forgotten' footage of a GoPro cam I had stuck into the corner of our booth. This particular footage was the evening where all the homebrew clubs from across the nation joined to share and talk about their beers. You can see fellow club members standing around, serving and chatting with others throughout this ~3 hours event... heck, I even make an appearance at one point! Overall a great night mingling with fellow brewers! Click on the below image to pull up the video (or click here to view or download a hi-resolution file version!). Cheers! It's ALIVE! The light and dark side of kombucha. I figured I would make a post about this topic as I appear to have several friends and/or family members interested in kombucha via my picture posts on Facebook. To do a quick, description in layman's terms, kombucha is a fermented beverage made from sweetened black or green tea. It is produced by a "symbiotic culture of bacteria and yeast" (aka SCOBY). Again, to put things in simple terms, a SCOBY is gelatinous 'blob' that is made up of bacteria and yeast... and visually looks disgusting. Kind of like a jellyfish or layer of slime one would find in a swamp or something. If you are able to get past 'the dark side', and look at the 'light side' (the healthy aspects of this probiotic drink), kombucha is truly a tasty, thirst-quenching, refreshing drink! I think the main reason it has been on a-lot of people's radars lately is because of the reported health benefits of consuming it. As reported in this WebMD page, kombucha is claimed to help your digestion system, boost energy level and help the body get rid of toxins... all of this is scientifically un-proven (just so you know). My wife got me turned onto this drink many years ago and we both went though a phase where we purchased several bottles a week. GT's was probably the biggest brand that came into the market (at least in our area) and came in a variety of flavors. Unfortunately, just like some exotic coffee brands, purchasing this at ~$3.00 a bottle, certainly added up quick! That's when I started looking into making it myself..
Pour the now sweet tea into a glass gallon jar or vessel you are going to let things ferment in. Once the temp is below 80° F, add the SCOBY! In about 5-7 days, sample the liquid to your taste (should have a mild vinegar essence to it). If you want to get more precise, take a pH reading using test strips; it should be in the the 3's). You can leave it go for longer if its not ready. This is what I have always done, but you don't have to. Secondary fermentation is the time you remove the SCOBY and pour off the kombucha into bottles (or a secondary vessel) to add flavorings and let it carbonate and get fizzy. I like to add ginger paste tagged along with some fresh/frozen/dried fruit pieces or fruit juice. This stage is all about your making something you like! You'll have to play with the amount of juice or pieces of fruit to add (depending on the size of your vessel or bottle). Personally, I use cleaned out, de-labeled, GT's bottles that I have accumulated over time along with some 38mm growler caps purchased from my local homebrew shop. I often let the fruit meld with the kombucha for a week or so; that give it time for the solution to become fruity effervescence! For me, I started out with the simple 1 gallon glass jar for my fermentation vessel, some store bought tea bags, some organic sugar and a scoby purchased through Amazon (see below for some links of things I have purchased). 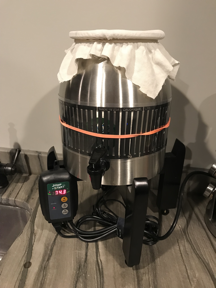 Over the years, I've added on to the setup to include a heat-wrap with temperature controller and most recently moved to a continuous brew system like this one from Midwest Supplies. Anyway, I could go on and on about this, so I will wrap this post up with this - for those of you who are looking for resources and places to go for getting into the kombucha game, check out these links that I have either used or purchased things through. Best of luck and feel free to hit me up if you have questions!